This system offers a wide range of sharpening solutions for your woodturning tools, bowl gouges, spindle gouges, scrapers, parting tools, skew chisels, and more. The Tru-Grind System is easy to set up, centers tools automatically for consistent results, and allows you to sharpen tools from 1/8" to 1-1/2" in diameter. 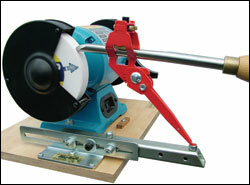 The tool holder head tilts to allow a wide range of grinds to be accomplished. The Tru-Grind System includes one base (can be used on the left or right wheel), one tool holder.